Modern and stylish Resume templates are perfect way to make the best impression When applying for your dream job / career. All resume templates are elegance with a modern design and well structured and very easy to use and customize. This Resume CV template belongs MS Word(docx/doc), PSD, AI, EPS, PDF versions. This template is 100% customizable and ready to print. A help file is included with the main file. It is designed for personal and corporate use. This professional Resume Template is made in Adobe Photoshop, Illustrator, Indesign format & MS Word aka Microsoft Word. This simple/clean Resume Template is professionally organized and labelled so every beginner can edit it like a pro. 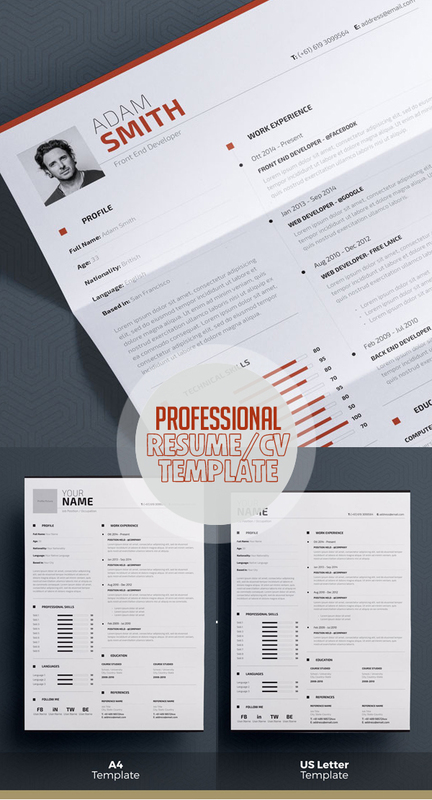 Resume / CV Template is a professional, Clean & modern resume template that will make you stand out from the crowd. Job Resume allows you to create your own personal brand logo in just a few minutes. Job Resumes easy to edit page designs feature bold graphics, sharp and clean typography. Everything you need to make a great first impression. This “One Page Resume” is the super clean, modern and professional resume cv template with cover letter to help you land that great job. 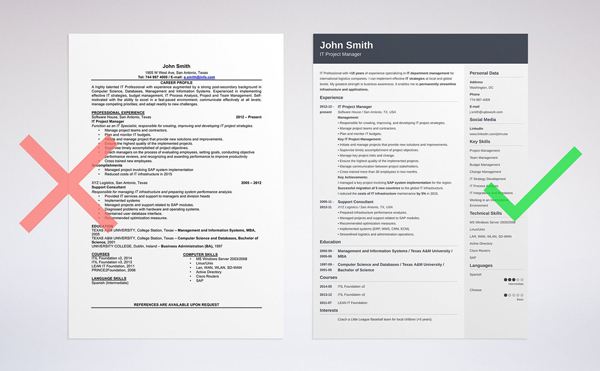 The flexible page designs are easy to use and customize, so you can quickly tailor-make your resume for any opportunity. Minimalist design that simplifies your job search, includes a resume, a cover letter and a business card. All of them available in 5 colors. 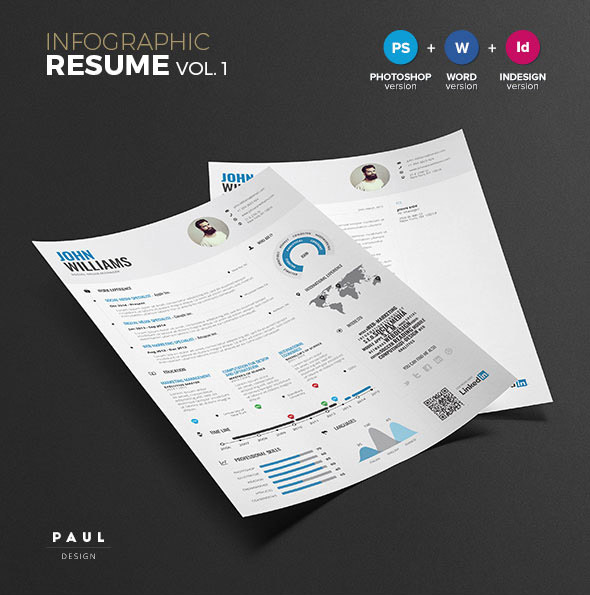 This professional graphic resume template comes in InDesign, Illustrator, and Word format. It has all the infographic and visual features you’d want to make a great first impression! Easy to customize Black and White Style Resume / CV Template. Get hired today! Your first impression starts with your Resume / CV, make it look the best you can with this template. Your Resume is your first chance to make an impression on a recruiter or hiring manager. The Magazine Style Resume template is the perfect choice. Strong typographic presence, very Easy to use and customize. Minimal design with a clean box and bold line style which punctuates your job history and skills. In addition to a resume, cover letter, and references pages, this design pack also includes a portfolio page for displaying your work. It comes in A4 / US Letter size. Also, the files come with both InDesign (INDD) and MS Word template options. This is the resume made just for you. It has a distinctive modern design with a highlighted visual theme that drives the eye to key areas of each page. It includes a distinctive cover, resume, letter, portfolio display options, and more. There are 24 pro pages that are fully-editable in InDesign or Photoshop. You can use a dark or light version. Just add your own career info and folio images, then print or export to PDF. This creative resume template has a clean, structured design that highlights relevant job info, and is made to read easily. It’s attractive to present your work and has a minimal intuitive design flow. It presents all your career detail in an organized, orderly manner—with subtle design details and infographic callouts. Classic modern design, and ample visual options, this resume template pack has a full assortment of files to build a creative resume with. It comes with 12 vintage logo styles, 24 retro images with effects, customizable resume pages, business cards, icons, and more. This creative template has a clean, modern design that feels on-style for professionals working online. It’s great for web designers, UI/UX experts, or marketing pros. It comes packed with resume/CV, cover letter, portfolio page, and matching business card template. It’s ready to work with in Photoshop (PSD), Illustrator (AI), or MS Word (DOC). There’s also a matching material style site template (HTML5/LESS CSS) you can grab as well, so you present a cohesive brand when applying for jobs. This is a creative resume with sharp design set in PSD, AI, and MS Word formats. It’s packed with multiple color variations, a full assortment of cover letter, resume, and portfolio templates, as well as infographic and icons options. 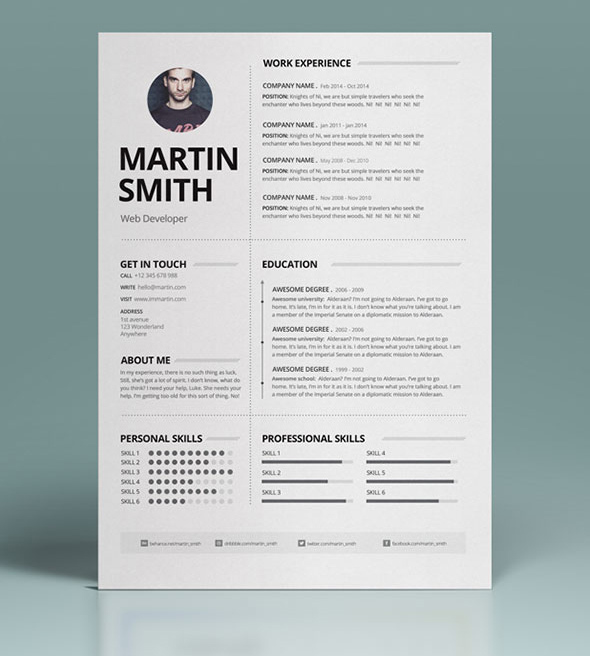 This visually striking resume template is made for individuals that work in creative fields. If you need to include portfolio images with your written resume or CV, then this InDesign brochure template is an appealing design to use. 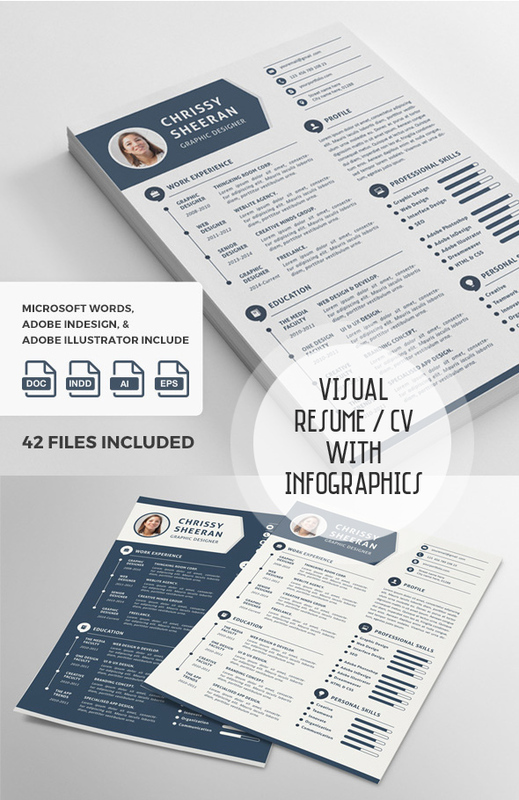 Make a statement and visual impression with this creative infographic resume. 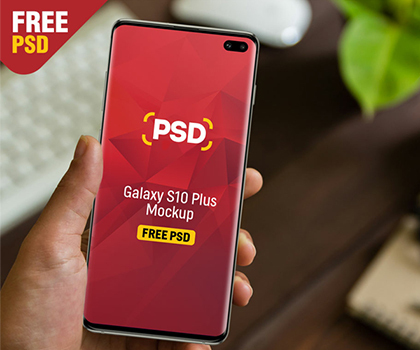 This modern template is designed to highlight your experience, showcase your work, and demonstrate your creative talent. This minimal resume template, has a strong baseline grid, that makes great use of font choices and whitespace. Present your resume and cover letter professionally, with subtle visual details, and simple infographics and icon options. 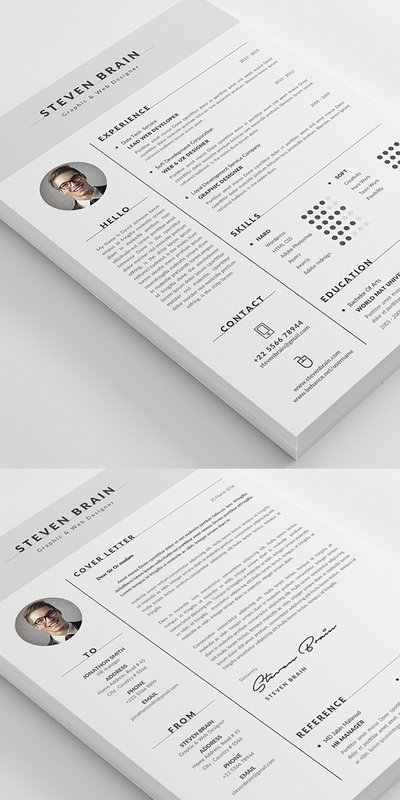 This professional resume, cover letter, and portfolio template set has a clean minimal design. It includes multiple color versions, infographic features, paragraph styles, easy to use files, and is set with free fonts. This resume template has strong typographic features, infographic options, clean professional structure, distinctive icons, and diamond offset boxes. It comes with both light and dark versions. This minimal resume template set has a number of creative features. It’s designed with bold type, and flat design illustrations, to showcase your personality and professionalism. 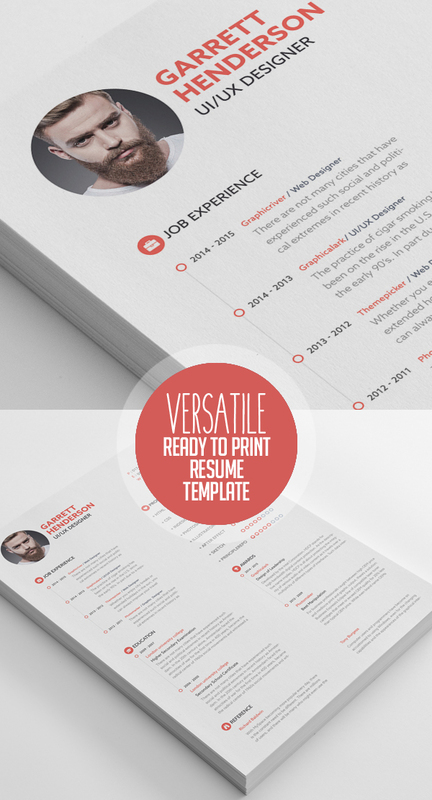 Clean Colorful Resume is a template designed with a minimal and clean style. Very Easy to use and customize. Resume PRO In Job interview resume creates the first impression about you. So it has to be professional and Unique. To do that we have created a professional resume template which is easy to use for everyone. We have included step by step Video and PDF tutorial. Layers are well organized and named so it’s easy to understand and edit. Professionally designed, easy-to-edit template package for the job seeker who wants to leave an unforgettable impression. Fast track your job search with a resume as professional, creative, and versatile as you are! Fully customizable in Adobe InDesign and in Microsoft Word. Unlimited edits for use again and again! and Bonus 50 Social Media Icons Included. This Clear Professional Resume Template with Extra Reference Page Cover letter to help you land that great job. The Template is Very Costumizable, You can change the color as you like, Remove unnecessary object and add your Own Information. Blogger Kit Co. offers easy to alter, fully editable media kits that come in a variety of styles. 5-Page Media/Press Kit Template (US LETTER), Media/Press Kit Template (3 Pages), Blog Sponsorship Kit: Proposal Letter + Ad Rate Sheet (2 Pages) and more. New high-quality, creative templates that may help you land your dream job or simply create a better looking business. Professionally designed, we take a unique approach to boring business documents, creating modern, sophisticated and easy to use templates just for you! Professionally designed, easy-to-edit template.resume as professional, creative, and versatile as you are! Fully customizable in Adobe Photoshop. Unlimited edits and ready to print. A help File is included with the Main File. This set of files includes a resume, cover letter and portfolio page in blue, orange and red color schemes. The files are layered PSD files for Photoshop. The format is US Letter 8.5×11 CMYK Mode and 300 DPI. A crop mark layer is included. Fonts used are free and are listed in the readme file. This graphic resume template package comes with six pages: front cover, resume page, references page, portfolio, letter, and back cover. 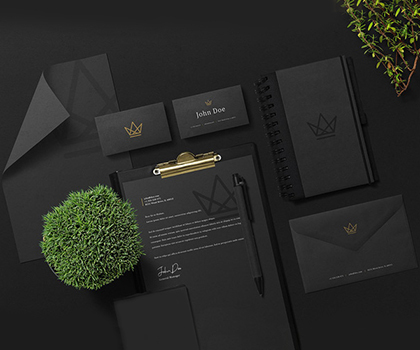 It’s a minimal, modern graphic resume design, which can be tri-folded for mailouts. It’s easy to add your info, make use of the infographics, and visual graphic options, and stand out professionally—with clean creativity. It comes in print ready InDesign format. This clean resume / cv file is in the Adobe Photoshop format and Ms Word, so you can use program that you wish to edit the resume, This resume / CV template is clearly organized and labeled so you can be confident in getting the best results in the fast possible time. 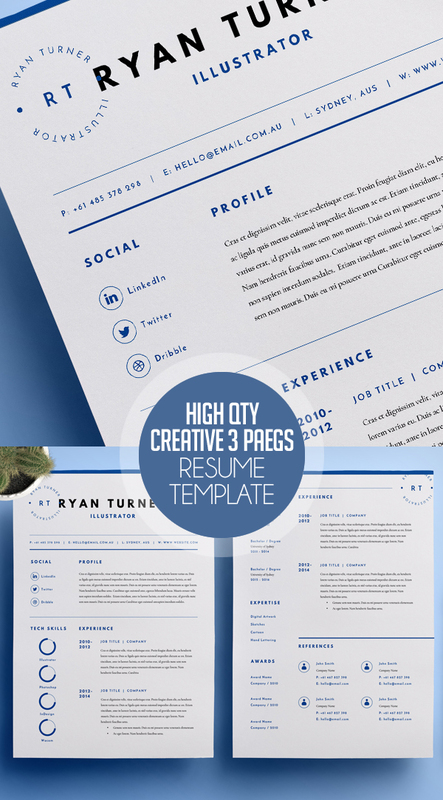 Professional 3-piece Resume template with clean and trendy layout. This template was nearly perfect for my CV purposes and I’m confident that this can make a “WOW”-effect when used accordingly. 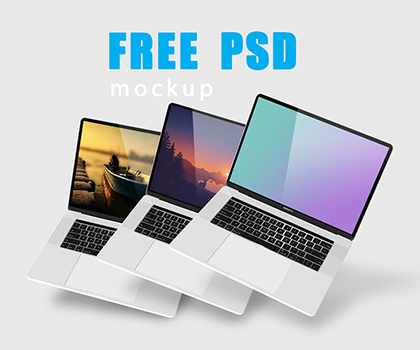 Creative three pages resume template with 12 total files inside available in PSD, AI, PDF, EPS and Cover letter & Portfolio pages included, Fully Layered. InDesign resume template with a clean and modern format. Creative and professional Resume / CV Template with amazing job oriented look. Inspirng page designs are easy to use and customize, so you can quickly tailor-make your resume for any opportunity and help you to get your job.